Then have some patience and read through the text. It could take some time to understand but it will happen. Let’s say this field is a marriage between classic mathematics and theoritical computer science. What is it and Why is it requried? While trying to find solutions for problems using algorithms (steps) we often encounter problems that are seemingly very difficult to solve. Before starting with various complexity classes let us first figure out what is an optimzation problem. Optimization problems are those where we try to maximize or minimize some value, say finding the shortest path in a graph for example. Contrast to this, Decision problems are those which have only one of the two possible answers – “yes” or “no”. Another example: Given a graph, is there a cycle? Given an input n, polynomial time would be any polynomial based on n, like n2 or n3 or even n1000 etc. However n! , 2n are all non polynomial time. We can say any algorithm that runs in polynomial time is a tractable, simple or solvable problem. These are actually superset of P. However unlike P they don’t have (as yet) solution in polynomial time. However if we give an instance of the input and say that for this input the decision problem returns “yes”, we can verify the same in polynomial time. Non Polynomial time solution and polynomial time verification. P is a subset because its solutions can also be verified in polynomial time and solution runs in polynomial time also. Let’s explain with an example: If there are 100 houses and each house has to be painted in a different color compared to all their friend’s house, it is not an easy problem to solve. However, the verification is trivial. If I already paint them in different colors and ask you to check if the painting has been done as per the above constraints, it is rather easy to verify the same. Go one by one for each house, see its color, check that it does not match with the color of friend’s house. Done ! Polynomial time verification !! We say that decision problem P reduces to decision problem Q in polynomial time if we can make a function f(x) to convert all inputs of P to Q such that if f(x) is given to Q and we get “yes” we will get “yes” if we give x to P. Basically what we are doing is converting one problem to another. It might seem funny to computer science graduates. Imagine if I were to tell that to sort n numbers we can actually convert it into a problem of graph theory and solve it. But that is what Polynomial reduction is and it is significant here. How about the problems which are in NP and are the hardest to solve among them. 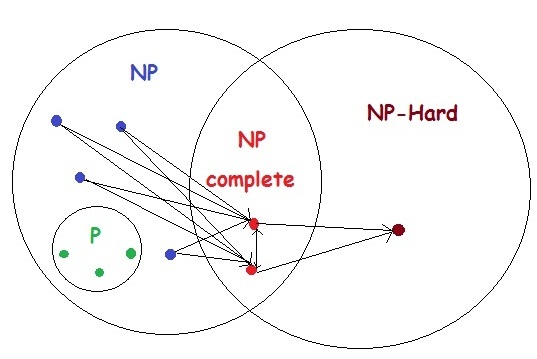 Such problems are called NP-Complete. So, if we arrange in order the problems based on how easy it is solve, from easiest to hardest, it would be P — NP — NP Complete.